BEIJING, March 29 (Xinhua) -- A month away from the 2019 Beijing International Horticultural Exhibition, workers are busy making final touches to the expo pavilions and gardens to ensure they will shine during the global event. Slated to kick off on April 29, the 162-day expo is poised to impress an expected number of 16 million visitors from home and abroad with a huge collection of plants, flowers and eye-catching pavilions as well as ideas for green development. More than 110 countries and international organizations as well as over 120 non-official exhibitors have confirmed participation, marking the highest attendance in the expo's history. 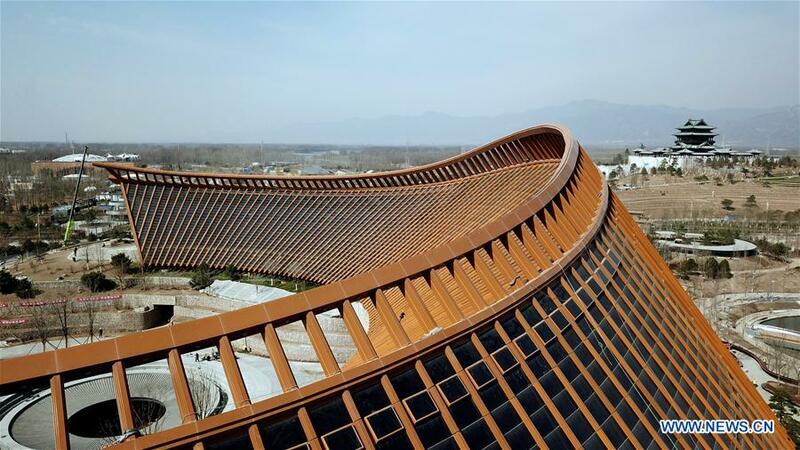 The exhibitors will vie to present their latest achievements in floriculture in the 503-hectare expo site at the foot of the Great Wall in Beijing's Yanqing District. At the center of the expo site stands the Chinese Pavilion, a curved exhibition hall in the shape of "ruyi," a traditional Chinese ornament symbolizing good fortune. As one of the expo's four main pavilions, it will display a wide variety of plant species from across China and showcase the history of Chinese gardening and horticulture. The design of the Chinese Pavilion echoes the expo's theme "live green, live better." With most of its earth-sheltered structure embedded in man-made terrace fields, both heat and humidity will be well preserved, said Jing Quan with the China Architecture Design and Research Group. The rainwater collection system on the pavilion's steel roof and a storage pond underground will be used for terrace field irrigation, Jing said, adding that more than 1,000 photovoltaic glass panels have been installed on the roof to utilize solar energy. Such exquisite designs are also found in other main pavilions such as the International Pavilion featuring 94 pillars in the shape of flower umbrella and the butterfly-shaped, multicolored Guirui Theater which will host the expo's opening and closing ceremonies. China's 31 provincial-level regions as well as Hong Kong, Macao and Taiwan will showcase their iconic cultural elements in outdoor exhibit areas, such as the giant panda-themed garden set up by Sichuan Province, miniature Mogao Grottoes by Gansu Province and a model of ancient Tibetan village house by Tibet Autonomous Region. The spotlight will also be on more than 40 gardens and pavilions built by international exhibitors and branded with each country's unique culture and history. Designed to show the quintessence of Japanese gardening, the Japan garden features a lovely courtyard dotted with trees, flowers, rocks, cascades and bamboo walls. The Azerbaijan Pavilion is modeled on a seashell, which symbolizes the country's "dynamism and passion for development and innovation," said Narmin Jarchalova, director of the pavilion. Besides Azerbaijan's native plants, the pavilion will display the country's traditional handmade carpets and photos of its landmarks, Jarchalova said, adding that a pomegranate tree, "a national symbol that embodies prosperity and fertility," has been planted beside the pavilion. "The Beijing expo will serve as a platform for participating countries to showcase their distinctive cultures," said Jiao Yutong with the Beijing International Horticultural Exhibition Coordination Bureau. "It will also provide countries with the opportunity to further cooperate in horticulture and agriculture." Tim Briercliffe, secretary general of the International Association of Horticultural Producers, said the Beijing expo would "attract many visitors to learn about the importance of greening and plants in their lives." "The expo provides an exciting opportunity to demonstrate to the world the latest thinking and new ideas on how plants and landscapes can make lives better," he said.